Tuborg Derby – a new game on Pointvoucher’s platform – Let's play! Tuborg has just released a new branded game connected to Pointvoucher.com marketing platform of mobile games and vouchers. While you race on the tracks you can play your way to gift vouchers and lottery tickets sponsored by Tuborg. The game resembles a classic horse track race, where you move the horse forward by throwing beer cans and hit the right holes. Choose a favourite draught horse and head for the start zone. Choose wisely as each horse has its favourite beer. Once in the race, throw cans with a swipe and try to hit the targets. Hitting the big hole will get you forward, but the small one will get you even further. Remember to throw responsibly otherwise you might run out of beer cans. 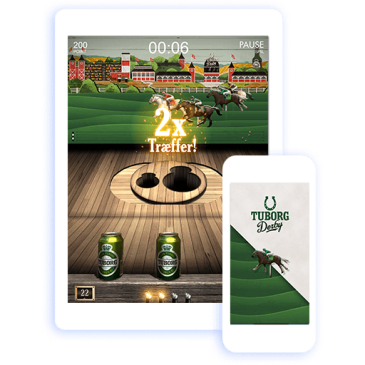 If you want to leave your opponents (Facebook friends) in the dust and rule the highscore, grab a Tuborg beer can from a Tuborg Derby campaign and redeem a Golden Horse Shoe by entering a promocode. Points are earned while playing, and they can be exchanged into gift vouchers of your choice in the Tuborg Derby Voucher Shop. Tuborg Derby is free for everyone, but you need to be over 18 to play. The concept and game is developed by Wibroe, Duckert & Partners and Copenhagen Creators.